I have an eArc that I am looking forward to reading. I just hope I like this as much as the first book. Nice! Seeing a lot of excitement for this one! Hope you love it too! Thank you so much for stopping by, Jessica! I haven't read the first book of this series, but this sounds interesting! Great pick! Thank you for visiting my blog, Ronyell. Oh, YAAAAASSS!! GREAT pick, Sandra!! I have the first book on my Goodreads shelves, and will now add this second one! I had NO idea that there was a sequel, for thanks BUNCHES for the heads up!! I haven't yet read the first book. It has been on my TBR list for too long. 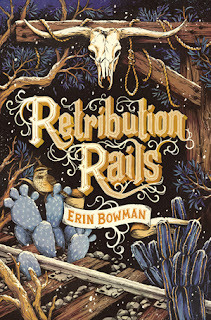 Maybe I'll be able to read it before "Retribution Rails" comes out. I haven't read the first book but I will be watching to see if people are loving the second one so I can read both!